This week my roofing contractor is 'doing' the roof. 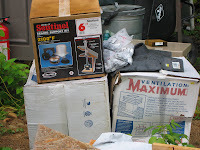 He is taking this pile, actually two piles of shingles - there is a smaller one behind -- and nailing them to the top of the roof. Do the on site building of some parts of the roof - for instance, the cricket which crosses the valley between the main roof and the gazebo roof. This is necessary to create a watershed effect to drain water to each side of the roof. Install the fascia board, that is the board around the outside of the roof edge. 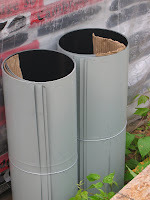 Install the chimney, which includes the ceiling support, the flashing where the chimney goes through the roof, inserting the insulated chimney components, and the chimney cap. Install the waste vents, there will be two. 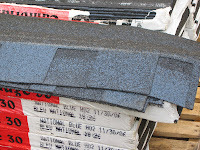 The style of shingles we are using is called Cambridge 30. These are a little different from the standard three tab that are the stable of most roofs, but once installed produce a 'cedar shingle' appearance. The '30' means they are guaranteed for 30 years. The colour is called 'National Blue'. Unfortunately the Cambridge style can not be used for the caps along the roof hips, nor as the starter strip. So an additional 12 bundles of the standard, 3-tab style, in this case called Aristocrat (not shown) are also required. Valley flashing will also be installed in each of the roof valleys. A roof valley is the place where two roof sections come down and join. The valley flashing comes in 10-foot sections. I was surprised when they arrived rolled up.